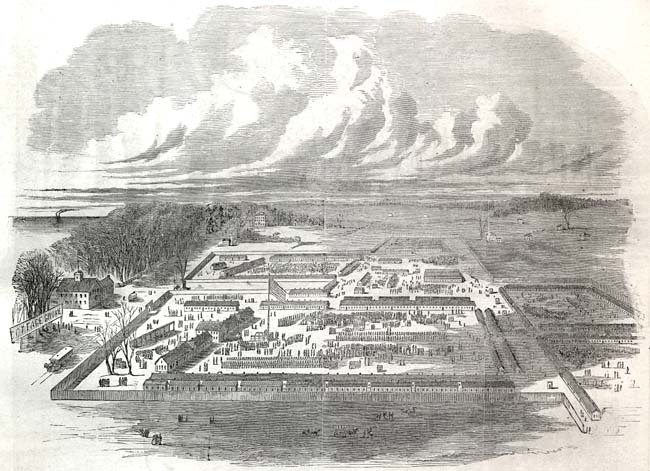 This illustration from Harper's Weekly, April 5, 1862 issue, pictures the camp on the prairie. The camp served as a prison for Confederate solders from 1862 through 1865. The reproduction below, from A.T. Andreas' History of Chicago, Vol. II, shows the location of the camp on the streets so-named at the time of the book's 1895 publication. On the 22nd of February, 1862, nearly 5000 Confederate soldiers arrived at Camp Douglas. The next day, 1500 more were added to their ranks. Largely due to overcrowding and insufficient sanitary and health care conditions, the mortality rate among the Confederate prisoners was alarmingly high. 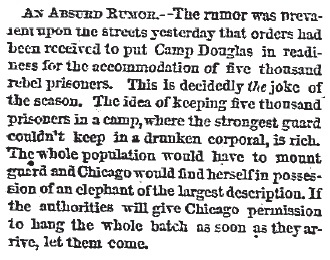 In the early days as a prison camp, the Chicago Tribune published a daily accounting of the occurrences at the compound. 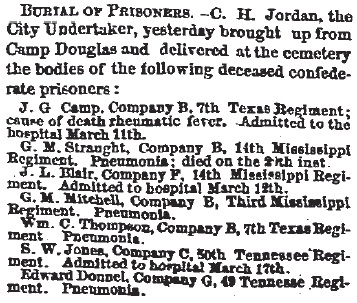 The newspaper also published the names of the prisoners who died each day. Some of those reports are reproduced here. WE publish on page 215, from a sketch by Mr. True Williams of Chicago, a picture of the REBEL PRISONERS AT CAMP DOUGLAS, near Chicago. Parties who were fortunate enough to obtain entrance to Camp Douglas yesterday forenoon might have seen standing, shivering in the snow, in about the centre of the parade-ground, a collection of men wearing all the colors of the rainbow upon their backs in the shape of raiment. There were seven or eight hundred prisoners in the group. Their clothes had been intended for a warmer country, and their frames were all unused to the cold weather of a northern climate; hence the prisoners looked pale, and actually had attacks of ague chills as they stood awaiting the preparation of their barracks. It was a matter for contemplation. A week ago these men were fighting under the serpent flag at Donelson. To-day they stood conquered, yet not entirely disheartened, beneath the stars and stripes, hundreds of miles from their homes and scenes of disastrous battle. A more wobegone appearing set of men it would be difficult for the reader to imagine. Compared with the laborers we are in the habit of seeing upon our public roads they would suffer somewhat, being less hardy and healthy in build and complexion. It may have been from exposure and low diet, but they were all sallow faced, sunken eyed, and apparently famishing. Some of them had food with them, and were eating of it as they stood. Others were rigging extemporaneous windlasses for a well and filling their canteens. The majority, however, stood gazing about the place, perfectly willing to be conversed with, and as willing to answer all questions put to them by their numerous visitors. These visitors were mainly respectful to the fallen foe. 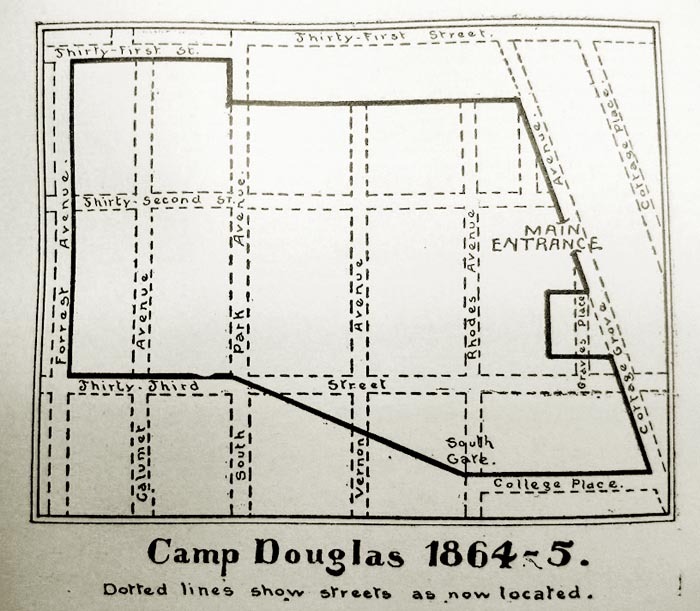 In fact, these men, and those who had been quartered in the southern portion of the grounds known as Brackett's Camp, appeared to be satisfied with their lot, and were free to say they had not been better treated since enlistment, or more comfortably housed and better fed than the prospect was they would be at Camp Douglas as prisoners of war. The uniforms of the Confederate prisoners are just no uniforms at all, lacking all the characteristics of infantry cavalry, or artillery costume, in being wholly uniform in color, cut, fashion, and manufacture. Some have coats of a butternut color, cut in regular sack style, and others fashioned, like those of our soldiers, as jackets or frocks. The pants are as diversified in color. Many of them have no overcoats at all, and supply their place with horse blankets, hearth-rugs, coverlets, pieces of carpet, coffee sacks, etc., etc. Their knapsacks consist of bags of all colors and sizes, comparing well with their coats and hats. The same remarks apply equally well to their canteens and other accoutrements, no half dozen of which seem to have been made at the same manufactory.